Today is part 2 of my new little series! In case you missed part one this is my most talented friend Brooke of BKWed. 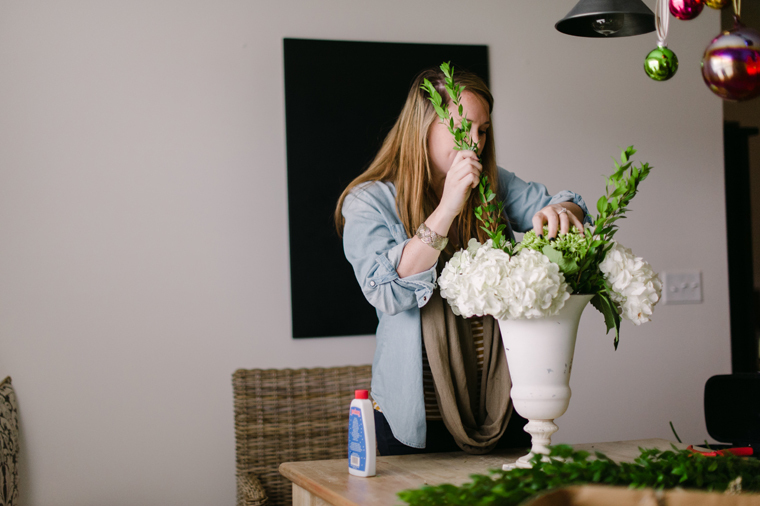 She was sweet enough to share with us simple yet gorgeous how-to's for arranging flowers. This one may be even simpler than yesterdays! I thought that you all would enjoy not only a fun and colorful arrangement, but also a neutral one for all us neutral nellie's. We used a urn that I had outside, of course this arrangment could be done in any tall vase that had a wider mouth. As for our main flowers we used hydrangeas. They are an all time favorite of mine. She stripped the leaves off the areas that would be in the water. She then messed with them till she found the look she was seeking. Basically Brooke laid them out so the arrangement would look good from all sides. She then started adding "fillers" to add some height and make the arrangment have more of an impact. In the end she also added the eucalyptus and dianthus green balls left over from the first arrangement to achieve a more fun, full, and elegant arrangment. -Above are the flowers we choose, but as I said yesterday you could easily create the same look with other variates depending on what you can find and prefer. -We happended to use an old urn that I had on hand, but any tall vass with a wide mouth would work. -A trash can near by with ample space to work. In our case we used the dining table. -The ability to create as you go. 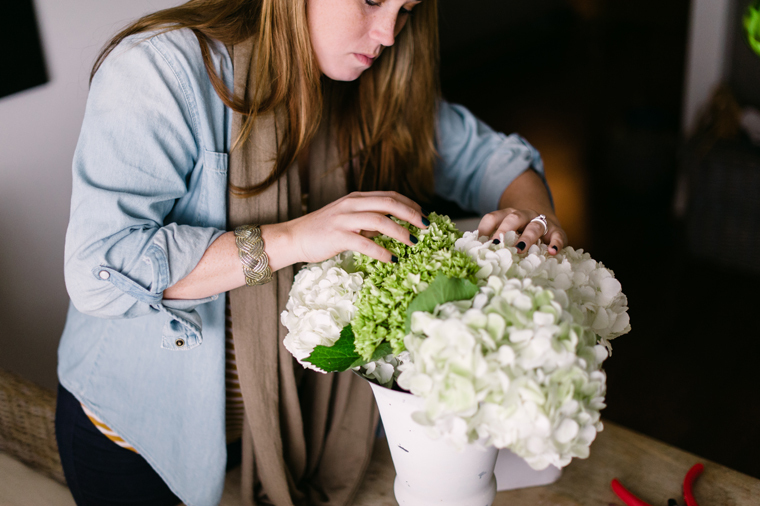 As in Brooke's case her initial thought of flower choices evolved a bit as she went along. In the end she ended up adding a few leftovers to acheive the look she wanted. We even contemplated going into my garden and cut rosemary and tree branches. In the end we decided against it. Does she just not look stunning in my neutral living room? Brooke really out did herself. Thank you Brooke for sharing your talent with not only me, but also Two Ellie readers. Hope we get to do this again in the near future! Flowers are needed for every occasion right? To see more of Brooke's work go to BKWed for a gander!